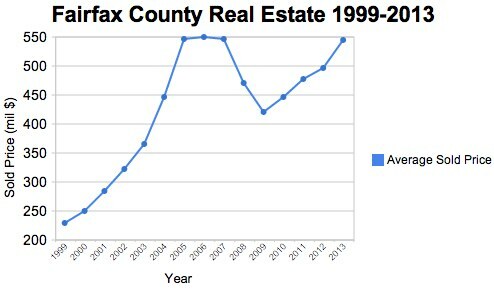 In the mid-2000’s, the Fairfax County Real Estate Market was going up, up, up – until the housing market bubble burst. Like the real estate market, at one point, Tiger Woods was at the top of his game, having won 78 official PGA tour events in only 12 years. 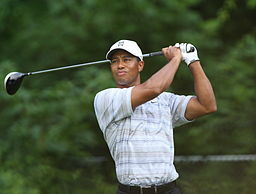 Disaster happened… and Tiger had to take a couple of years off from competing. But after his time off, he came back and is now at the top of his game again. Like Tiger, after a couple of years of a correction, the real estate market prices in Fairfax County have returned to a steady climb. Is the Fairfax County Real Estate market back? According to the following graph, the average sold price in May of 2013 for all residential properties in Fairfax County is almost $550,000. This current price of $550k is comparable to the levels that we saw in 2004 through 2006 (what some people consider to be “the height of the bubble”). From this graph, you can see that the housing prices in Fairfax County are higher now than in 2008 and 2009 (after the bubble burst). Better yet, it looks like prices have been steadily climbing for the last 4 years. However, the concerns that I’ve heard from some home buyers is that this rise in prices might be part of another bubble. Is the Fairfax County Real Estate market going into another bubble? My feeling is that we are not going into another bubble. The first bubble was obvious to many of us. The main reason for the rise in prices of the 2000’s was that banks issued loans to under-qualified buyers. When these buyers couldn’t pay for their loans, many homes went on the market and there was more supply of homes than demand for them. The result was that prices came down, and we had a market correction. Because of that experience, lenders are now under strict underwriting guidelines to ensure that borrowers don’t stretch themselves as much when obtaining a loan. People this time around are either buying homes with cash, or obtaining a loan – but only after being thoroughly qualified by a lender. These last couple of years, prices have been driven up by interest rates being at their historic lows. resulted in a monthly payment of $3,394. And when demand goes up, prices go up too, which accounts for the rise in prices from 2009 until now. Well, it means that the Fairfax County Real Estate market IS back! It also means that there are still many opportunities for purchasing a home now, while the interest rates are low. Downloading The No-Tears Guide to Moving to Fairfax, VA is free, and you’ll get access to our unique home-search (by school boundary). Plus, you get the Fairfax County Real Estate Affordability Map, AND access to detailed information about each Fairfax County School boundary. How is the Fairfax County Real Estate Market? (Feb 2013 Update) Fairfax County Real Estate – How is the market? Fairfax County Real Estate – When is the best time to buy ? The Fairfax County Real Estate Market flipped!